Angelique: What happened at the lab? Cyrus: Something. Something happened. It just happened all of a sudden. Angelique: We’re going to put a spell on Quentin. We’re going to reach deep into his heart, and make him long for Maggie so much, that he can’t bear it. Hannah: You may be making a great mistake! A spell that affects the heart can be very dangerous! Angelique: Not if it’s kept under control. Hannah: But it can’t be kept under control! There’s no telling how Quentin will react! He may even become violent! Angelique: I don’t care how he reacts! 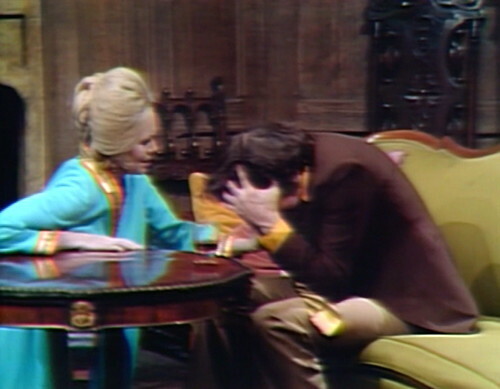 Quentin: I believe that you are the Barnabas Collins those people are talking about! It’s been six months since we last clapped eyes on Quentin Collins — a rascal with a theme song, a rebel with a trading card set, a mystery that should never be solved. Where did that Quentin go? 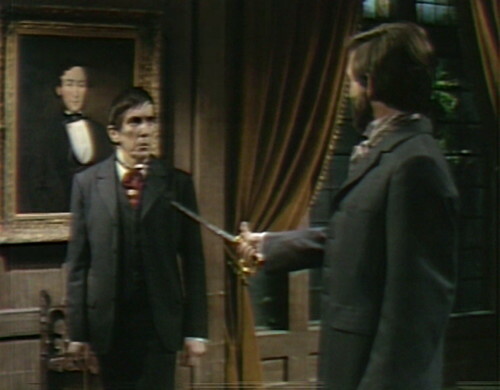 Quentin: You haven’t answered my question, Barnabas. 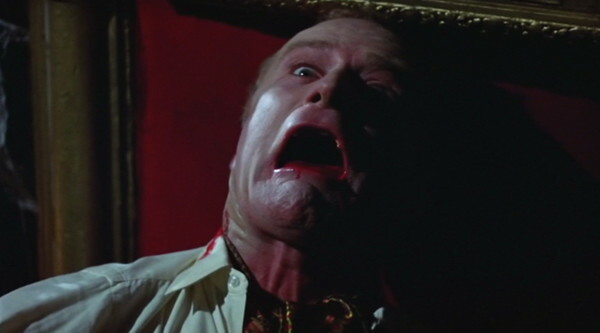 Barnabas: It sounded more like a statement to me. Angelique: We will need mandragora and spring water, for the potion. 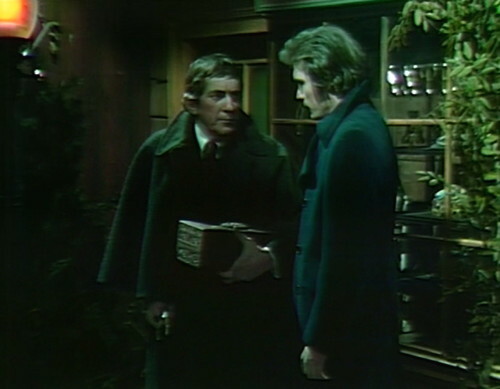 Quentin: Are you the same Barnabas Collins those people are talking about, or not? Cyrus: Can you remember the exact feeling you had? Angelique: I won’t let you leave until you understand why you did that! Angelique: I have a theory. Quentin: I don’t want to hear about it. Angelique: Quentin, you must admit that you’re filled with antagonism. Quentin: Don’t explain myself to me! Angelique: You’re not going to leave until you tell me exactly what you were thinking when you came across that room with that knife! Quentin: Hate? Was it hate? For the portrait? Maggie? No! I don’t think so. Quentin: Am I losing my mind? Cyrus: Quentin, don’t be ridiculous. Angelique (tiny): Quentin, don’t you see what’s happening to you now? You’ve lost all touch with yourself! You don’t even know what you’re feeling at any moment! Angelique (tiny): When do you think it all started, Quentin? Are you the same Barnabas Collins those people are talking about? Angelique: Are you sure it didn’t start the night Maggie left Collinwood? Angelique: I don’t believe you. Angelique (tiny): Why are you afraid to admit that you’ve been lost since then? Angelique: You’ve got to go back to that point. You’ve got to relive it! Angelique: You see how you react? There’s so much violence in your feelings for her! Are you the same Barnabas Collins? Quentin: Then why did I slash Maggie’s portrait? Cyrus: Any number of things. Don’t forget the strain you’ve been under lately! Angelique: But there’s always violence in love! What you did to the portrait just now should prove it to you. 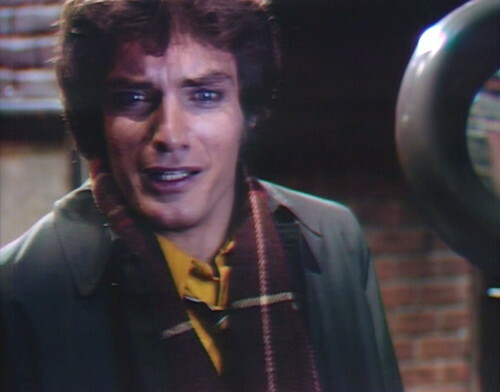 Cyrus: You met Barnabas Collins? The man they’ve been talking about in the empty room? Quentin: No, no, no, no. Not him. 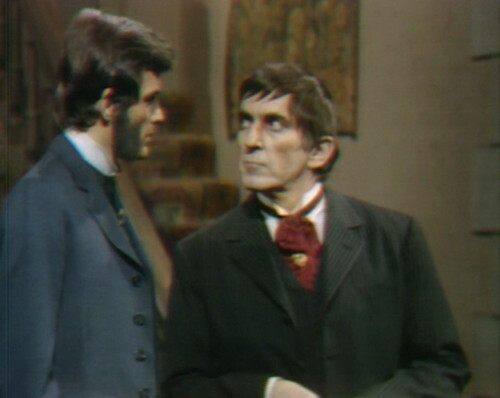 Quentin: He’s a distant cousin, a descendant of the first Barnabas Collins. He just turned up the other evening. Are you the same Barnabas? Cyrus: Well, isn’t it possible that when you reject someone, you put them out of your life, and in a sense, that’s killing them! Cyrus: Why wouldn’t you feel guilty, and find some way to act it out? Angelique: When do you think it all started, Quentin? Cyrus: Are you in pain? Quentin: Pain? Yes. But not a physical pain. 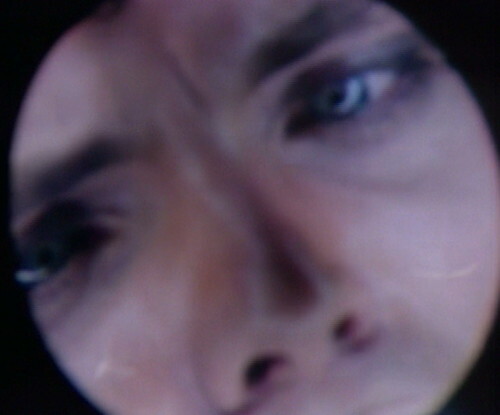 Quentin: What’s happening to me? Quentin: Why am I acting this way? Quentin: Yes. It was a very deep feeling. 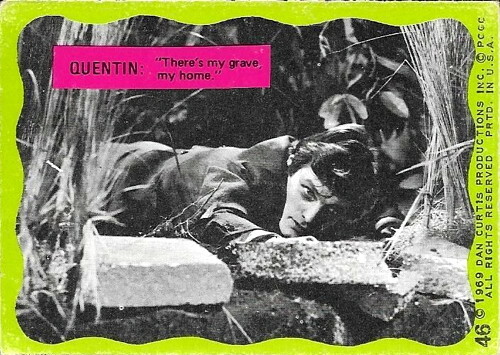 Are you the same, Quentin? Quentin: It was a feeling deeper than I’d ever felt before. Cyrus: The yearning you mentioned. When Quentin runs away from Angelique, we hear a door-slamming sound effect — but when she gets to the front door, it’s wide open. After Quentin runs out of the house, there’s an establishing shot of Collinwood in the daytime, to show that it’s morning. But then they fade to Cyrus’ lab, where Quentin is talking to Cyrus. 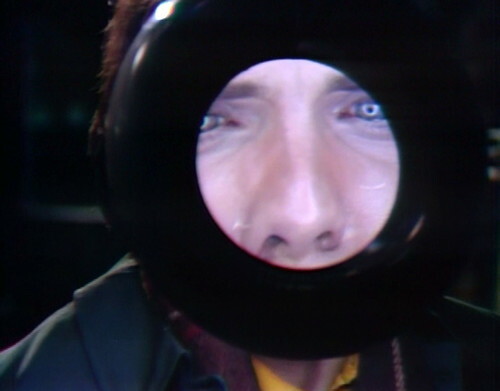 The implication is that the lab is in the basement of Collinwood. When Angelique walks downstairs to Cyrus and Quentin, she stumbles on the first step. There are several awkward camera moves when Hannah and Angelique argue in the drawing room. This is Paula Laurence’s last episode as Hannah, although Angelique talks to an unseen Hannah on the phone in tomorrow’s episode. After this, Laurence has small roles in several movies — the 1978 horror film The Eyes of Laura Mars, the 1988 romantic comedy Crossing Delancey, and the 1993 Michael J. Fox vehicle For Love or Money. You really captured the feeling of the show at this time…well done! Go to the 21st photo. Can anyone identify who is the bearded man wearing a denim jacket in the 21st photo? Andrew- If you can describe what to do: how does one “check the file name”? I tried to right click the mouse over the image to find, for example, info such as properties of the image, etc. No luck. “We have to go back” is an important moment in Lost, and that’s Jack from that scene. I like finding parallels with Lost, because it’s mysterious and funny and metaphor heavy. My favorite is in DS episode 864, where there’s a hatch in the ground at Shipwreck Point, which is a two-pointer as a Lost reference. The other Lost parallel in today’s post is that they constructed these complex little puzzleboxes that make sense to the creators and just baffle the audience, which is basically what I’m doing here. While I was watching LOST it did strike me that elements of the show reminded me of Dark Shadows. 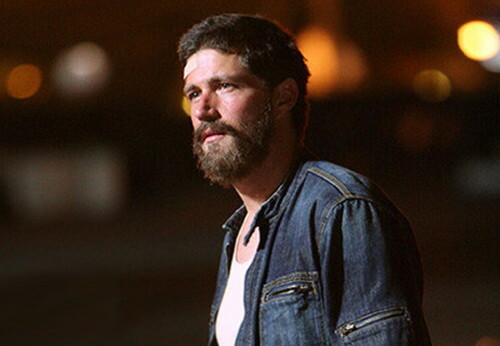 Especially in the final season when Desmond crossed over into what seemed to be a band of Parallel Time, where the characters he knew were all living different lives. And like it as long as you live. 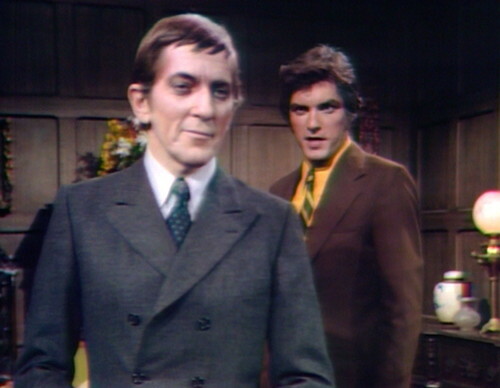 A really good post that shows the the peaks and valleys of Dark Shadows over the years. sometimes good decisions and just plain damn good luck in casting and characters. You have put me into a fugue state from which I am still waiting to emerge. 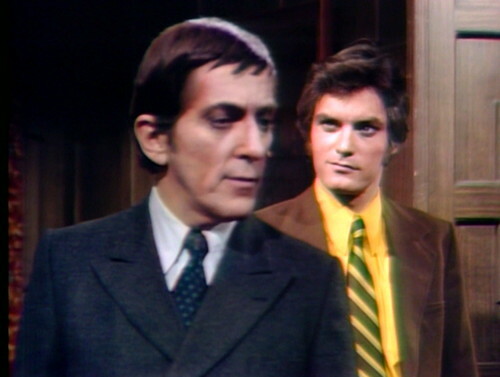 Is there a geek name for fans of Dark Shadows? And – that really is an awful portrait of Maggie. The Josette portrait is meant to be from the 1700s, women (especially wealthy women) were generally portrayed as… Rubenesque. Don’t suppose either portrait ever appears in the TV show. You ask the question, where did the “rascal” Quentin go? I think you answered that just over a year ago in your post about episode 838 in which Count Petofi intervenes to save Quentin from being killed by Beth while simultaneously destroying the “rascal” character. 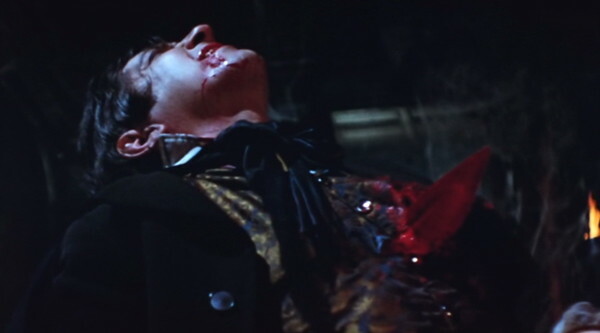 By the way, Barnabas may not have been the one to stop Beth but ultimately, in a Rube Goldberg type of way, he should get credit for saving Quentin by going back in time in the first place. 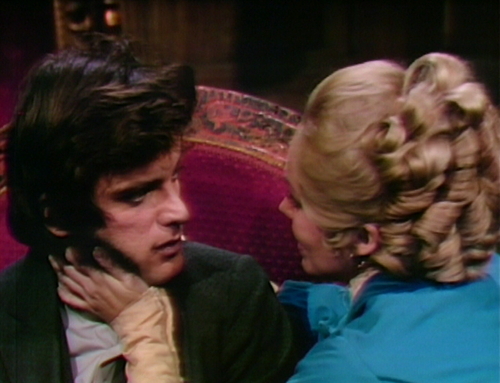 His presence resulted in Angelique being conjured up, Magda obtaining the hand of Count Petofi and bringing the curly haired geezer to Collinsport. Does she have a job? What does she do for a living? Shouldn’t one of us be going to work occasionally? And who’s funding the Longworth Institute? Sabrina’s got to be paid for her indispensable assistance. And I bet that “Do Not Touch” juice is pricey. Why don’t PT Roger and Liz have jobs? They’re just sponging off the rich relations? Guess the only real cash cow is Daniel’s paper route. And on a different subject, since Angie has used the bar to create Love Potion Number Nine, it may truly be said to be a “magic” drinks cabinet now. I remember that PT Liz was complaining to Hoffman that her check had not arrived in the mail near the beginning of the storyline. Wasn’t that a check from Quentin? I don’t recall. Apparently PT Liz was married to Paul Stoddard. Maybe he was sending her alimony checks. 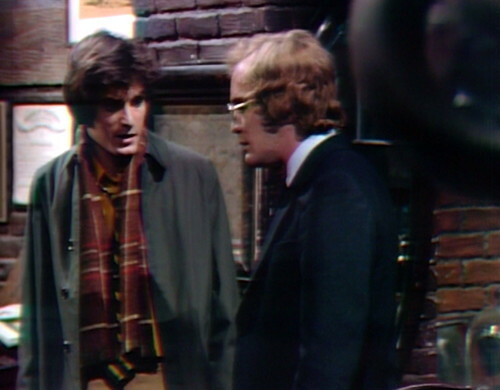 John, a friend and I watched the episode from ’67 where Liz confessed to the killing (which we later found out that Paul wasn’t really dead). We’re big Joan Bennett fans and I think that this episode was her Dark Shadows showcase. I meant to say that we recently watched the episode. Such a shame that her character was given so little to do after that plotline ended (though she was great as Naomi (check out Episode 458!) and Judith (Episode 879)). Don’t know if you have seen Joan Bennett’s audition for Gone With the Wind, but in my opinion she was the best of the runner-ups. And her turn as Kitty March in Scarlet Street is one of my favorites – the ‘chicken bone’ moment is priceless! Her turn as Spencer Tracy’s wife and Liz Taylor’s mother in Father of the Bride and Father’s Little Dividend are also classics. John, as a Joan Bennett fan, I’ve watched so many of her movies. Her Scarlet Street character was about as far away from her Liz character as one could get. Liz would never eat grapes and spit the seeds on the floor! LOL. Yes, I agree that Joan was a good contender for the role of Scarlett in Gone With the Wind. Such a pity that the ‘Gothic soap opera’ format did not allow her to use her considerable comic talent. Would have been wonderful to have seen Liz and Roger having a light moment! 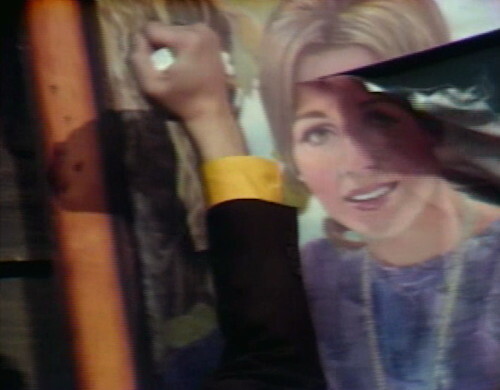 I think that this episode was her Dark Shadows showcase. The reunion episode between Liz and Paul Stoddard is another standout. 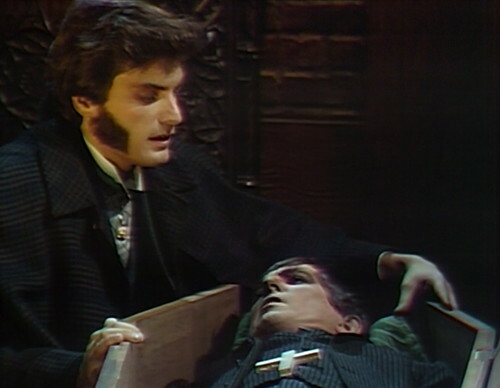 Agreed, and I think it just goes to show that they could have done a little more with the soap aspects of Dark Shadows and the audience would have been fine with it. Just saw that myself, and surprise, she steals the show, as you can tell that she’s enjoying this. They never mention what happened to Paul Stoddard in PT. He may have died and Liz is a widow. Hooray, PT Liz hit Paul with the fireplace poker. I’ll wager she didn’t go the ‘buried in the basement’ route, either. Liz: There’s no use my being anything but honest with you, Julia. I keep looking for a check, and it’s not here; it’s most embarrassing. Julia: I know it must be, Mrs. Stoddard. Liz: When Quentin was here, Roger and I always got our monthly checks on time. Julia: I’m sure Chris just overlooked it. Liz: Chris knows our position. It’s almost as if he’s trying to insult us! Julia: I’ll talk to Chris myself. I thought it was Quentin, too, but it looks like Chris is the one who cuts their check (late). The REAL reason Chris disappeared from the show. He embezzled the fund and took a jet to South America. Liz’s in-story decline was a heartbreaking thing to watch. She was written and played as this amazing tower of strength who held the family and business together through sheer force of will for 18 years without leaving the house, and when she was finally free of her own self-imposed exile, Laura came along and cursed her and it was like she never fully recovered. I mean, it made it easy to give Joan Bennett a vacation whenever she wanted it, but it was painful to see Liz floating around as a shadow of her former self while Roger had to step in and take over the business and Carolyn run the household. 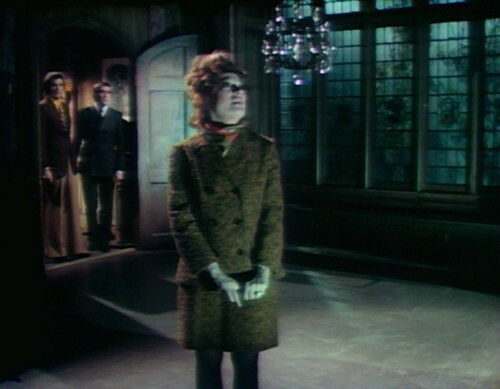 This is where the Madeline Usher-like Liz of House of Dark Shadows originated; a lot of people who saw the film probably never saw the iron-willed matriarch who hired Vicky in the first place. 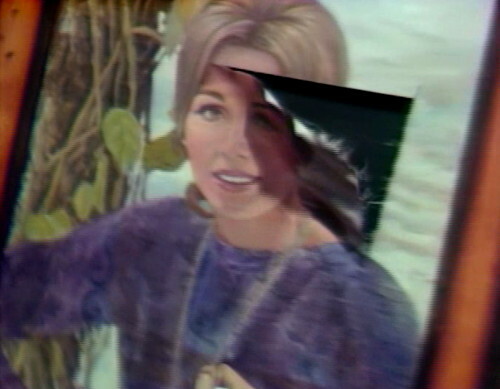 Liz was another casualty of centering the show on Barnabas. They had less and less to do except be foils for the vampire. It is a shame, because I could see how Liz could have continued to be a central figure even after she is cleared of Paul’s murder. Make it so that, after Liz sees that she does not need to guard a non-existent corpse, she goes on a cruise, to celebrate her freedom. When she comes back, she is appalled to see Roger, Carolyn, and David doing what they want, not what she wants them to do. She then schemes incessantly to regain the power she lost, and those schemes can advance the plot in many ways. I like to think she’d also have come back from her cruise with a handsome boy toy gigolo (think Paolo from The Roman Spring Of Mrs. Stone) – who decides that Carolyn is a better prospect. Oh, I love that. And this boy toy has his own dark secret…. And after he crosses both Luz and Carolyn, he goes on to live a long, healthy life… HAHAHA! Maybe there’s room in the wall next to Reverend Trask. I love it. 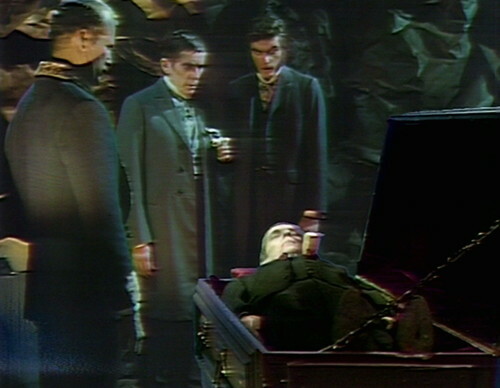 Yes, I was thinking ‘dark secret’, too – perhaps a vampire who (unlike Barnabas) has embraced his condition and revels in it. 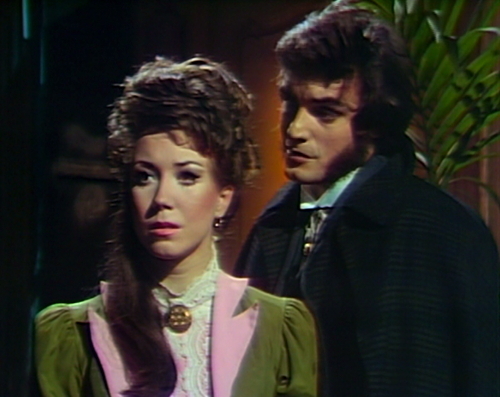 That gives Barnabas and Julia an ‘in’ to the story, as they try to work against the interloper and save the Collins family yet again. You could see her displeasure with the writing for Liz, and she looked bored, stumbled through her lines, and it was so great to see her play the others. Like Flora. What a great character. Flora was definitely a welcomed change of pace. She only played Flora as a comic-relief character at the beginning of 1840. In time, she was becoming more and more like Liz. I had an idea way back when to keep Liz busy in the storylines. Judah Zachary cursed the Collins family to live through one tragic situation after another. 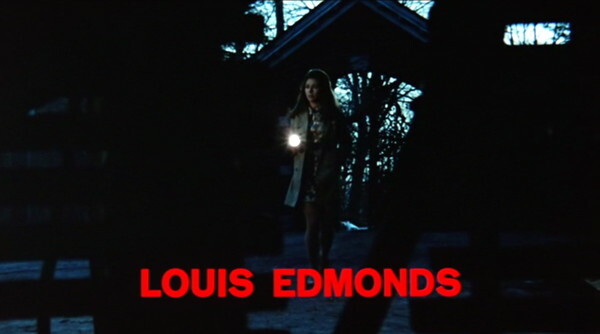 In each generation, one family member is bestowed with certain supernatural powers to contain the evil spirits and demonic influences present at Collinwood. 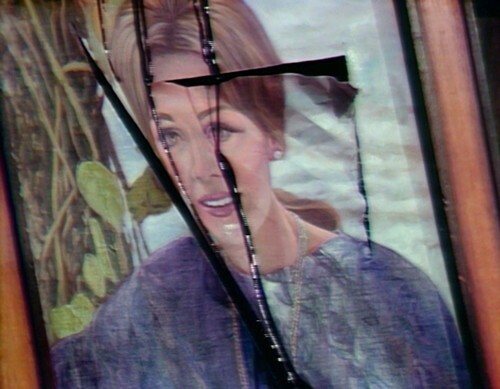 Liz could have been the “good witch” whose job it was to protect her family from these various entities as well as the town of Collinsport. Danny? Are you trapped in Parallel Time, forced to dictate your blog entry for Episode 1015 to William Hollingshead Loomis? Even worse, he could be trapped in 1841 PT, which means he’s first got to get out of parallel time and then head down Quentin’s staircase back to 2017. He’s hangin’ wit da Halkans. Probably just hanging out in one of those parallel bars. He’s hanging out in a parallel universe where Scott Baio is a nice, kind, sensitive, smart guy. OK. Well here’s a topic I find interesting: How did Grayson Hall/Julia Hoffman slowly but surely take over the show? 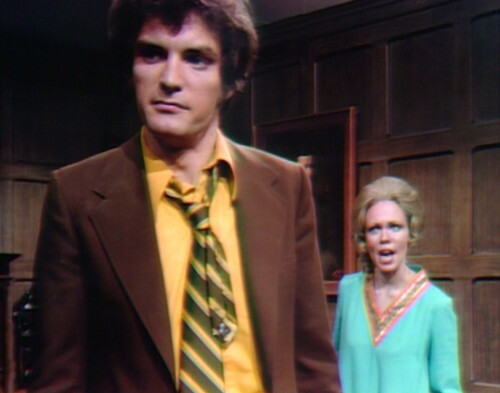 DS began as the story of Victoria Winters with Elizabeth Collins Stoddard as the grand dame of Collinwood, then became the Barnabas Collins show, then the Barnabas & Julia show, and by the end seemed like it was solely the Grayson Hall show. 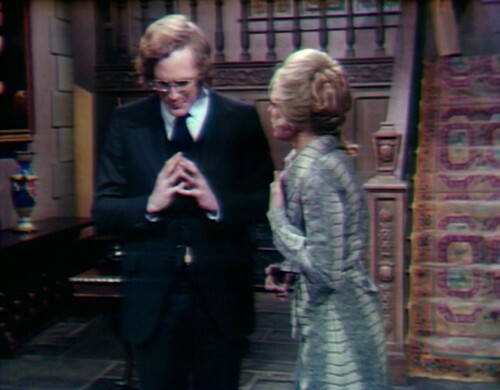 Please don’t misunderstand – I do like much of Julia’s character/Grayson’s work especially in years 1967 to 1969, and she was undoubtedly essential to Dark Shadows’ storyline and its successful run. However by the end I thought how Julia was dominating the story and the other characters much too much. 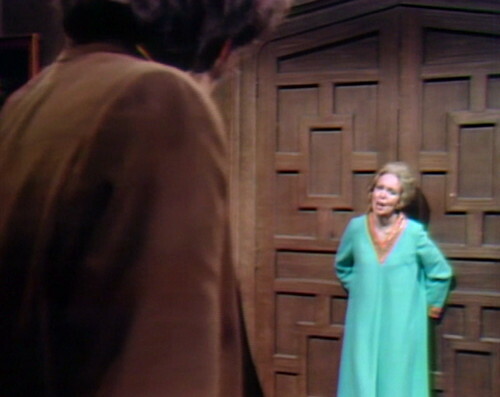 Joan Bennett’s Elizabeth character began as the family matriarch, but became quite sadly diminished over time (as pointed out by commenters several comments above) as Grayson Hall and her various characters continued to rise ever higher in prominence until Julia/Grayson eventually eclipsed Liz as the person in charge at Collinwood! I did not have this opinion when I watched as a kid in 1969. I just really, really liked any scene with Julia in it. 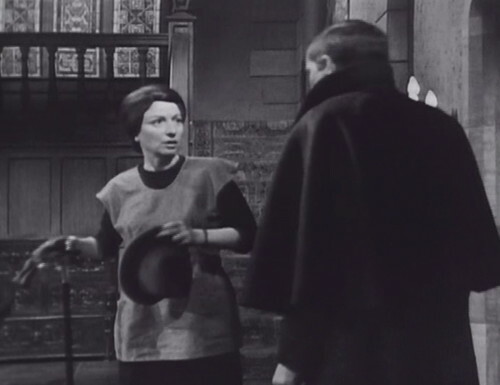 But then when I re-watched the entire series as an adult, I’d often ask myself,, “Why is her character taking over so much?” and “Is this a reason why Jonathan Frid admittedly hated her?” By the end of the series, I quite frankly found Julia’s dominance rather irritating. I think that the biggest question I had (even watching this as a teen) was why was Dr. Julia Hoffman still a resident at Collinwood after she revealed to Liz and the family that she was a doctor? She was the poster child for Codependents Anonymous. She didn’t care enough about her own life so she had to “take care” of the Collins family, and apparently rent free! In hindsight, I think the writers should have made Julia a distant cousin of the Collins family. 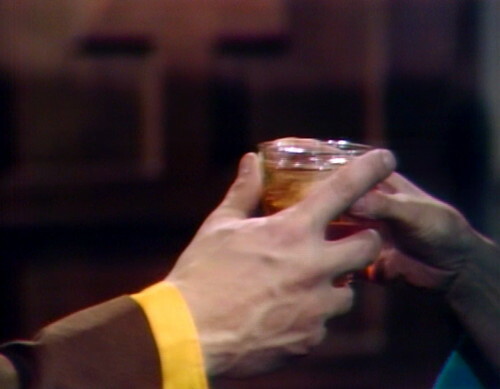 That way she could still have romantic feelings for Barnabas, but it would also justify her being at Collinwood. In essence, the writers figured this out in the final storyline (1841 PT) where Julia was a Collins. Liz definitely should have had more of a role throughout the series. I liked her when she was strong in the earlier storyline. As I stated in an earlier post, Liz should have been the given some supernatural abilities to protect her family and the surrounding village from the evil that preyed on the Collins family. Thanks! I guess it’s just my inherent desire to see happy endings for these characters I learned to love over the years.I had quite a few concocted in my mind. It was the perfect platform for Julia to continue to meddle in their affairs and family secrets. But I agree Julia being given her own room at Collinwood made no logical sense. I never recall Julia having her own home, just a laboratory here or there, although I suppose she might have had her own digs somewhere at the Wyndcliffe prison/hospital. 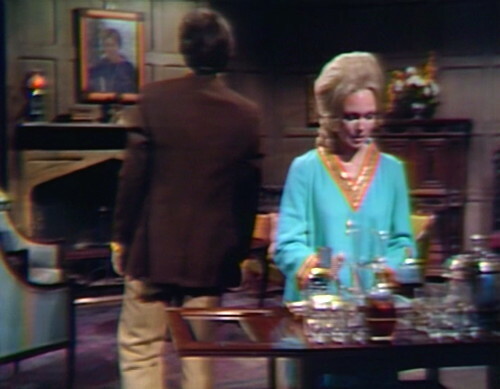 In addition to her room at Collinwood, Julia also seemed to have a second home, or at least a major hangout, at the Old House, judging by the large amount of time she spent there, either with or without Barnabas. 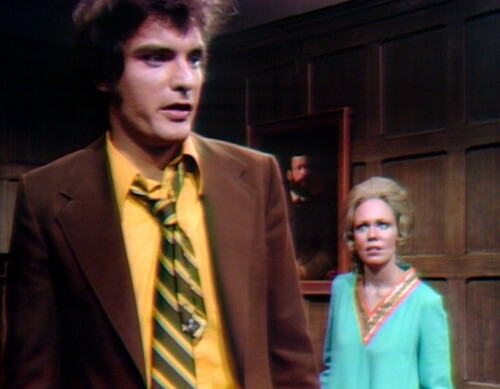 I’ve lost count of how many times she was there in the Old House parlor — nervously glancing at the clock or her wristwatch — worrying, waiting for Barnabas to show up? She must have had her own key made! Oh, that’s right, I forgot the doors are mostly left unlocked — even with all those monsters roaming the estate grounds! 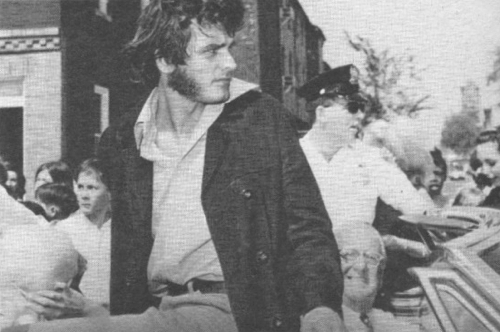 So Hoffman was free to explore all the nook and crannies at Collinwood. Then if she got bored with Collinwood, she could swing by the Old House at dusk for a visit, where she’d park herself in one of the Old House parlor chairs, reading a history (or medical) book until Barnabas rattles the steel jail door as he ascends the stairs from the basement. From Julia’s behavior, coming and going as she pleased, you would think she owned both mansions!! I don’t think they ever completely gave up the fiction of the books she was supposed to be writing with Barnabas. And the family kept going from crisis to crisis, in which her presence generally was more useful than her absence would have been. Plus, where else were they going to get all those prescription sedatives? Her husband was the head writer and I bet that had a lot to do with it. Also – she was a recently Oscar nominated movie actress so, she probably had an understanding with Dan Curtis that she was going to be front and center if she came onto his afternoon soap opera. I agree. Also, as time wore on, Dan Curtis began to be interested more in a career in movies, and therefore he was less interested in the TV show. I suspect as Dan lost interest, Sam and Grayson had more freedom to increase the size and import of Julia’s role. Connection to “MadMen”: There are a few similarities between this discussion of Sam, Grayson, and DS and a plot in MadMen, set in 1967 or 1968, where Don Draper’s wife Megan is aspiring to be an actress, so she lands a part on a soap opera to further her acting career. Arlene, the lead actress of the fictional soap in MadMen (played by Joanna Going, who coincidentally played Victoria Winters in the 1991 DS Revival Series) is married to the head writer of the soap. Megan Draper and her waitress girlfriend, practicing lines together for an upcoming audition, actually mention the names “Burke Devlin” and “Roger Collins” during their practice on “MadMen”! So then you know for sure that the audition is for a role on our favorite TV show! For more, look up “MadMen,” Season 5, Episode 9. Also, Joanna Going was in a couple of other MadMen episodes at about that time. P.S. And the title of MadMen Season 5, Episode 9 was … can you guess? 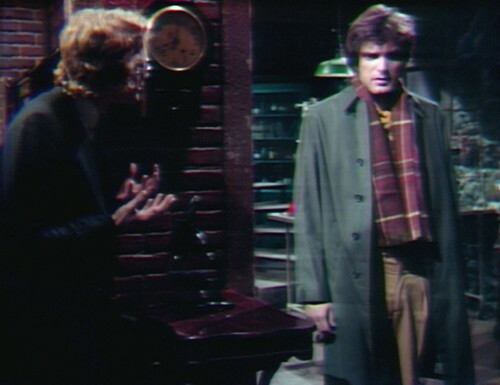 … “Dark Shadows.” I kid you not!! All these coincidences! That is fantastic! I have GOT to watch Mad Men now. I’m probably the only person left in the universe who hasn’t. 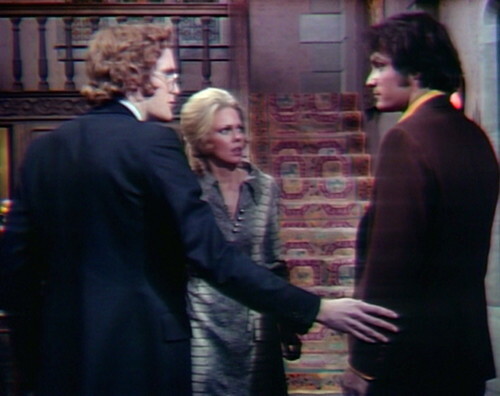 Having a Dark Shadows connection makes it required viewing for us DS fans! Never seen MM either, so that’s two of us…I did watch Jon Hamm on Graham Norton, and he was funny and gorgeous (Graham found a picture from Jon’s high school yearbook – from football – oh, MY!) I highly recommend Graham Norton’s wonderful chat show. It’s interesting that you say Julia eclipsed Liz. I haven’t watched the first year of DS in decades but my recollection is that while Liz is a major player, the actual protagonist is Vicki and we follow the events of the show through her eyes (hence the narration beginning each episode: “My name is Victoria Winters…”). Julia clearly takes over from Vicki as the female lead/protagonist. It helps that she knows the truth about Barnabas, but prior to 1795, that seems almost to her character’s detriment. 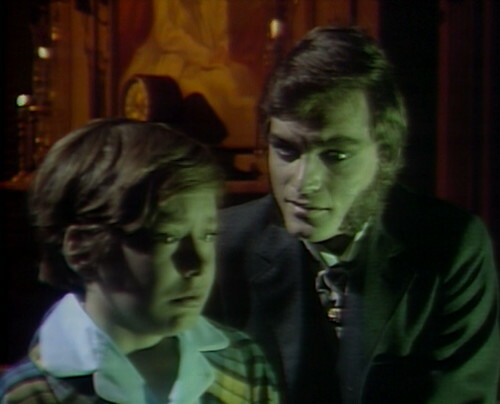 Knowing Barnabas’s secret meant to expose Barnabas and end the only interesting storyline. Julia had a target on her back. 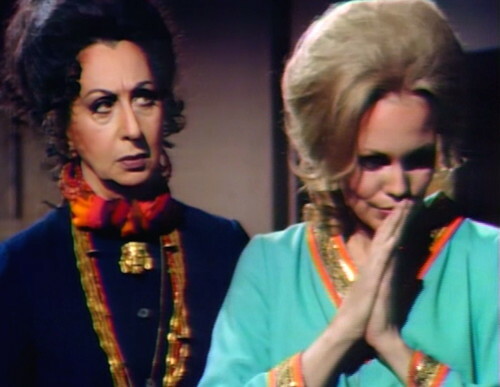 But the decision made in 1968 to have Julia work with Barnabas basically saves the show. He has a confidante/friend, and she has a purpose beyond potentially “exposing” him. It’s also around this time that Vicki is further marginalized to a clear supporting character. I agree that by 1969, Julia starts to function as “family matriarch” in a way. She is personally invested in the Collins family (even Quentin comments on this!). 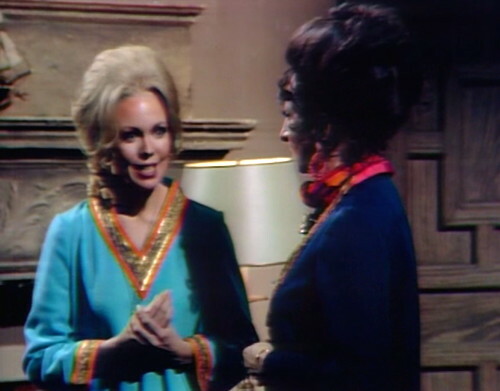 I felt like if you’d watched a random episode in mid-to-late ’67 or early ’68, it would be clear that Julia is a house guest not a family member but by ’69 and definitely by the ’70s, it would be an easy mistake to assume she’s a Collins. Ultimately, though, Julia “dominates” the show because she’s a compelling character. I wouldn’t call her a ‘creator’s pet’ or anything. Her character is ideally suited for advancing plots and making stories more interesting. What she wants is almost always aligned with what the audience wants. Almost everyone (I can’t think of any other characters offhand) were either “Normals” or “Monsters”. Generally a N who entered into M territory perished, except when they got a memory wipe (the ‘goldfish syndrome’) or became M.
But Julia stood with a foot in both worlds, keeping (trying, anyhow) the N world safe, keeping the M world in the shadows even as she tried to defend it. Julia knew there were even worse monsters… Stokes did so for a bit, but faded off along with Adam (yes, he was around in the rest of the series, but rather like a Deus ex machina). Since I have not seen how it all ended, I don’t know if this theory holds up for Julia or Constance Collins. But it really comes down to the writing – she was given a rich characterization, and as any decent actress will do, she ran with it. Julia Hoffman was a survivor.